All of the themes listed are important to the evolution, maturity, and adoption of the platform. 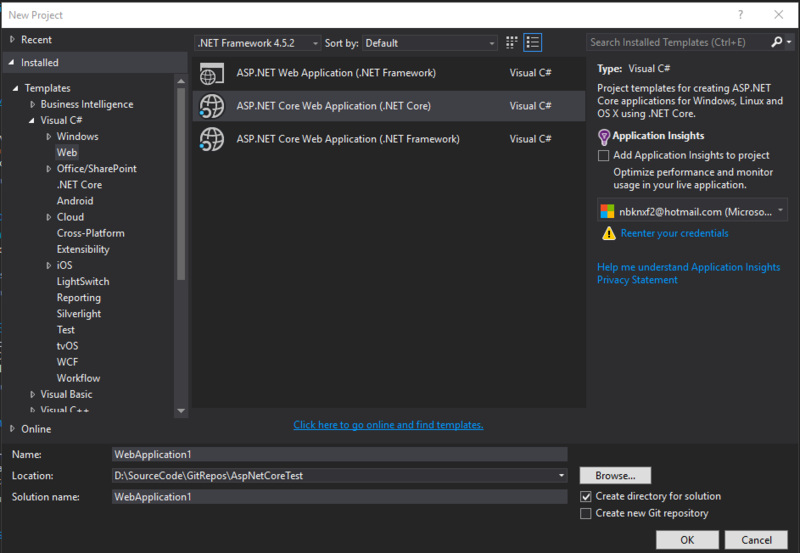 Starting a new project with .NET/ASP.NET Core 2.1 Preview is a simple process and follows the familiar workflow of creating a new project in Visual Studio. 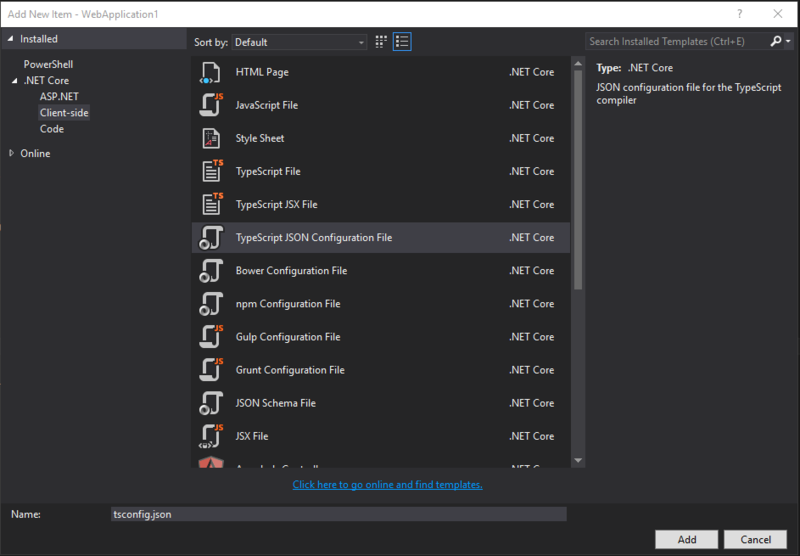 Upgrading an existing .NET/ASP.NET Core 1.x/2.0 to .NET/ASP.NET Core 2.1 Preview 1 is a little more involved and this walkthrough is aimed at assisting you with the process by providing a breakdown of my experience. 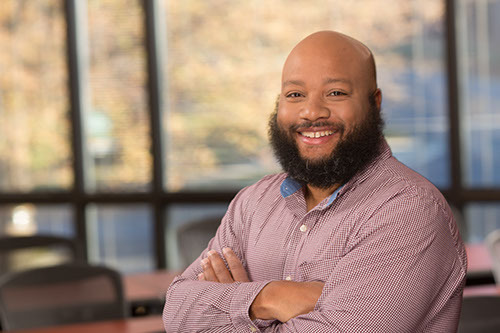 When I present on the topic of web development, I typically use a reference application I created that is used to demonstrate technologies, tools, and software engineering techniques to the attendees. As these topics evolve, so does the reference application. 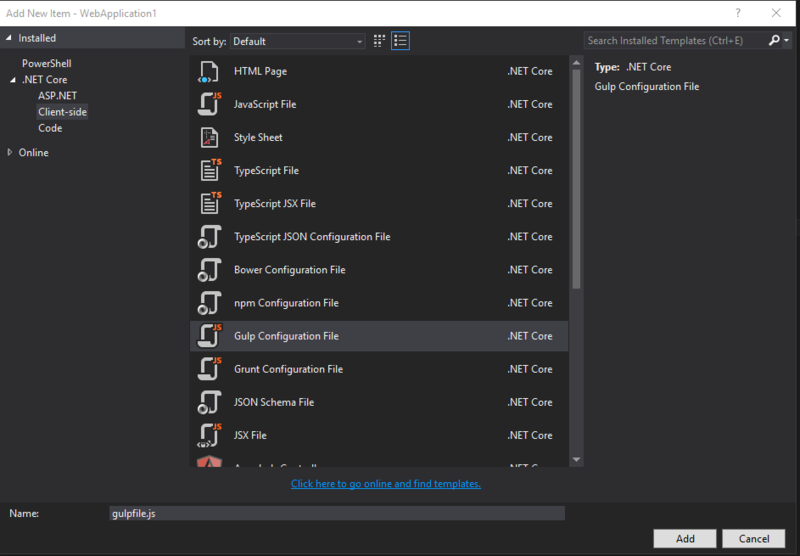 In preparation for the upcoming release of .NET/ASP.NET Core 2.1, I spent sometime recently upgrading a Web API project that is a part of the reference application. The SDK installs side-by-side with other versions of the SDK but your default SDK will be the latest version which is the preview. 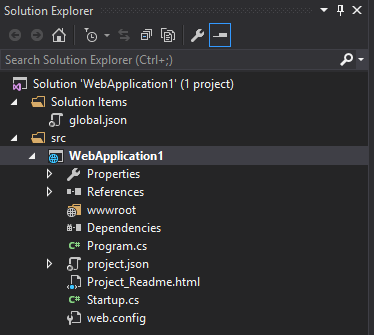 If you have problems with other projects and the preview SDK, you can force a project to use a specific version of the SDK using a global.json file as documented here. The 64-bit installer version is 128MB. Not a huge download but make sure you have a decent connection to the internet. Since I was modifying the .csproj file, I thought it was a great opportunity to perform some cleanup. (This step is not required.) 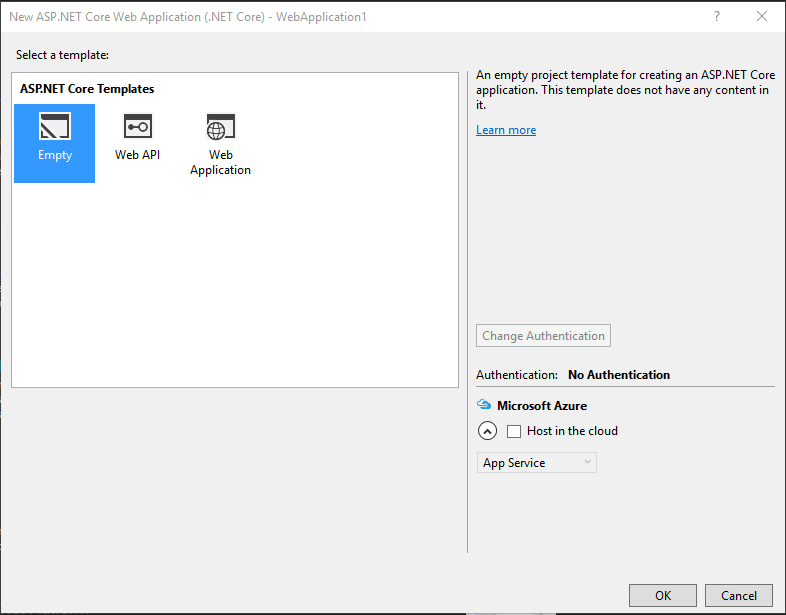 This Web API has existed since the .NET Core 1.0 RC days and at that time the practice was to list each of the needed packages from Microsoft.AspNetCore and Microsoft.Extensions individually. The result in this project; a .csproj file with 15+ package reference elements. 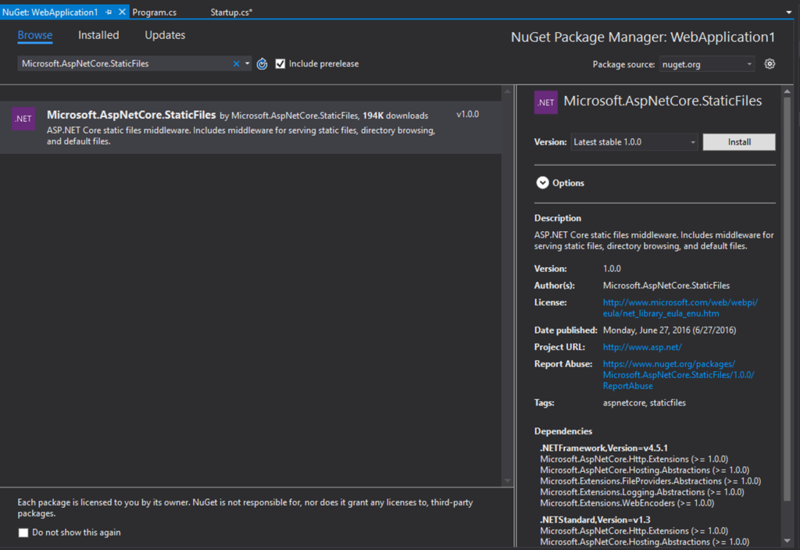 Now, there is nothing technically wrong with this but later versions of ASP.NET Core offer a way to reduce the number of package reference elements in your .csproj file. 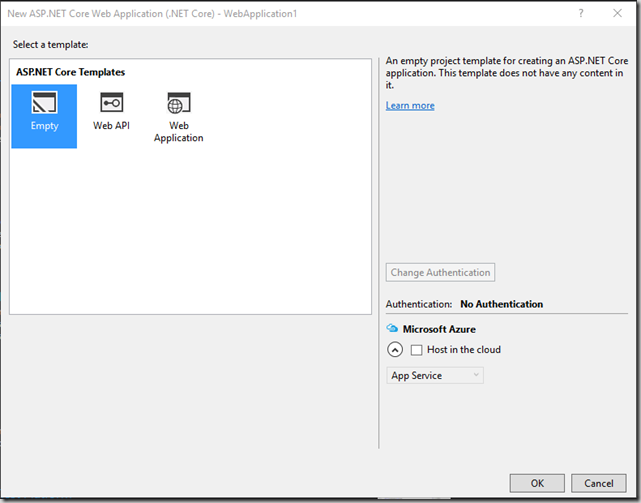 As I stated earlier, this Web API project was originally created in the .NET/ASP.NET Core 1.0 RC days and things are done differently now. As you can see, the recommended approach is to have main call a method that returns IWebHostBuilder which is configured to know which class to use during startup. Main calls the Build and Run methods (in that order) on the returned IWebHostBuilder which starts the application. 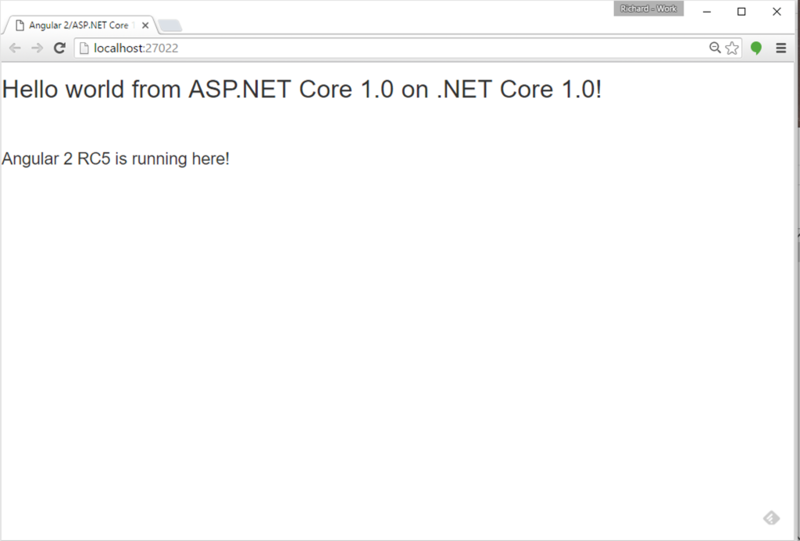 Finally, I was able to build and run the upgraded Web API that is now using .NET/ASP.NET Core 2.1 Preview 1. 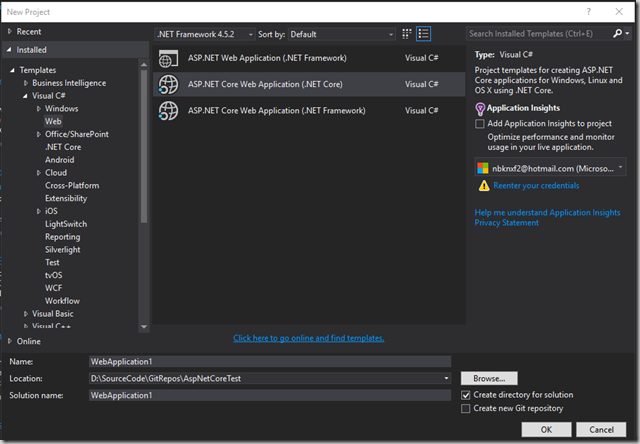 I haven’t explored any of the new features of .NET/ASP.NET Core 2.1 Preview 1 (except for the HTTPS enhancements) but I’m looking forward to leveraging what the new platform has to offer. Lately, I have been spending time learning Angular 2. 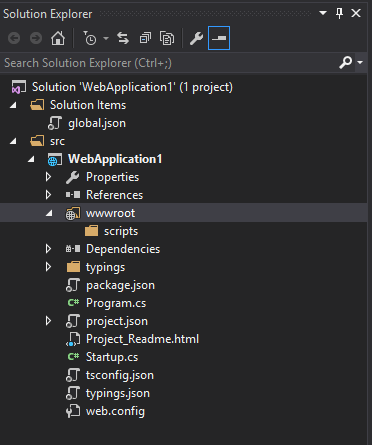 During my study, I have seen many examples of setting up and getting started by using Visual Studio Code, WebStorm, and other excellent IDE’s. I have also read several articles about setting up and using Angular 2 beta versions with Visual Studio 201x. 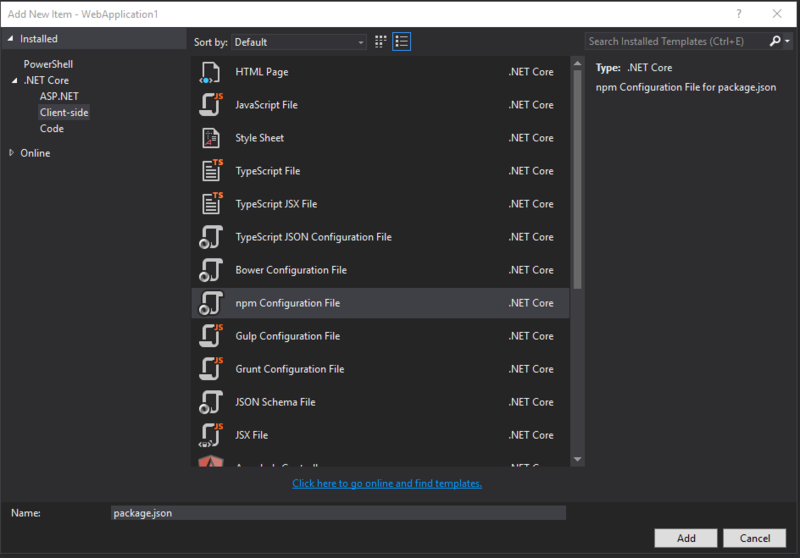 Since I spend most of my time using Visual Studio 2015, this article will show you how to setup Angular 2 RC5 with Visual Studio 2015 and ASP.NET Core 1.0 on .NET Core 1.0. For a more in depth understanding of serving static files with ASP.NET Core 1.0, please visit here. 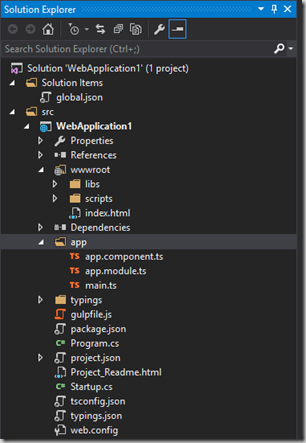 Immediately after saving the package.json file, Visual Studio will begin downloading all the dependencies listed to a folder named “node_modules” in the directory where your web application is located. (If you would like a detail explanation of these settings, you can go here.) In addition, you will probably receive an error message stating that npm was not able to resolve Typings dependencies due to a missing “typings.json” file. Let’s create that file now. Save the typings.json file. If you would like an explanation of these settings, you can go here. Now if you switch to the project.json file and save it again, Visual Studio should complete the installation of the dependent modules without error. Save the file. If you would like an explanation of these settings, you can go here. We are going to use SystemJS to load our application and library modules. To do so, we need to create a configuration file for SystemJS so that it can locate the code we need loaded. If you are interested in the settings in the “systemjs.config.js” file, you can go here. 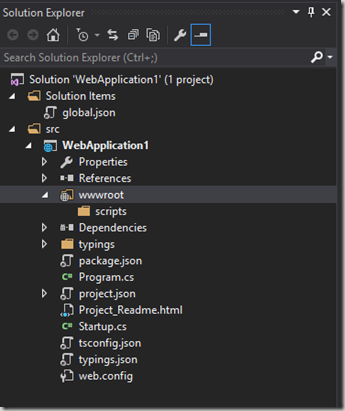 There is one final configuration step to complete and then we are ready to code our Angular 2 application. 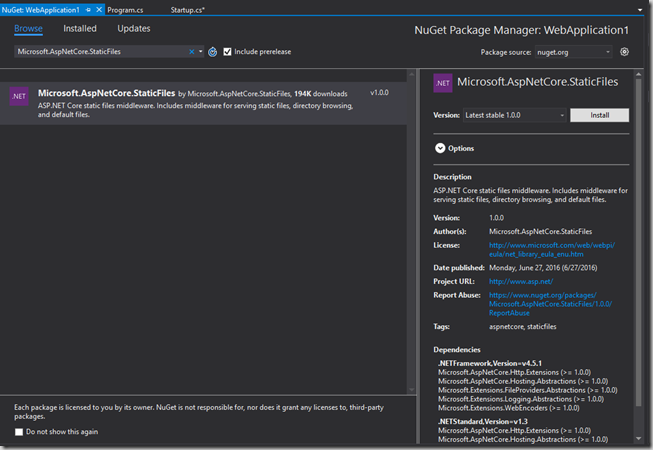 As stated before, ASP.NET Core 1.0 serves static files from the wwwroot folder by default. As a result, we need to move required library files from the node_modules folder to a location under the wwwroot folder. In addition, if we would like to perform any debugging of the TypeScript code in our browser development tools, we need to have the original TypeScript files served from the server. In order to accomplish this, we are going to use a gulp script to handle copying the files to their needed location. 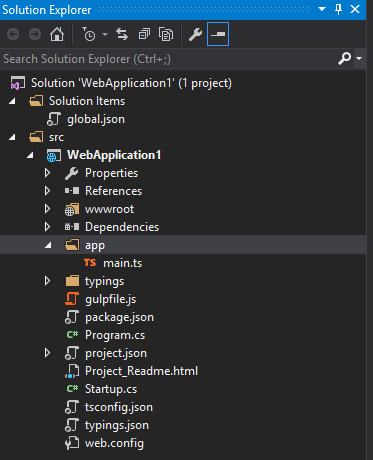 The gulp file is configured to execute after a successful build of the solution once the Task Runner Explorer is setup. From the VS menu, select “View”, “Other Windows”, and then “Task Runner Explorer”. 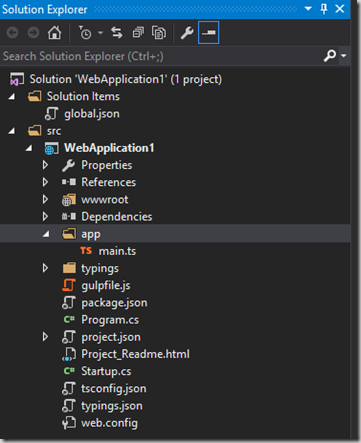 Click the “Refresh” button (top left, next to the application name) and Task Runner Explorer will read the gulp file. You should see three(3) task: clearAppDestinationFolder, clearLibsDestinationFolder, and moveToLibs. You should also see the number three(3) next to the “After Build” Bindings. Now the gulp script will execute after a successfully build. Okay, finally let’s code our Angular 2 application. 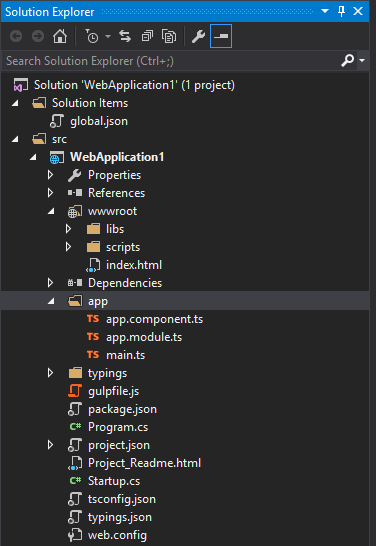 Now let’s add a new folder name “app” that will contain all of our TypeScript code for our Angular application. 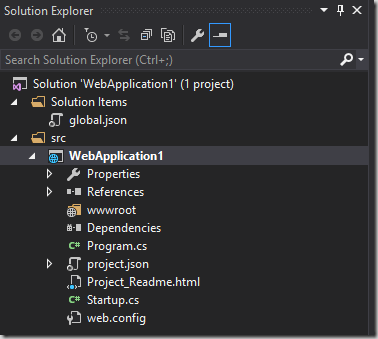 “Right-click” on the web application project and select “Add” then “New Folder”. Name the folder “app”. I will publish another blog post with more details about the three(3) TypeScript files we just added. If you would like more information now, you can go here. 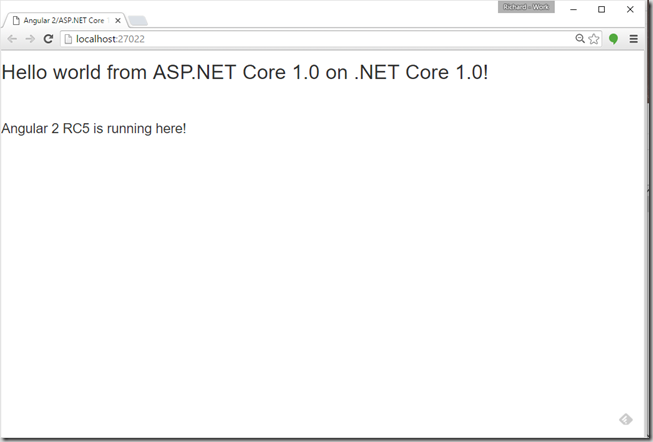 We have an Angular 2 RC5 application served up from ASP.NET Core 1.0 on .NET Core 1.0 and built using Visual Studio 2015! You can find a Visual Studio solution here. I hope this post is helpful with getting started with Angular 2 development using Visual Studio 2015 and ASP.NET Core 1.0 on .NET Core 1.0. Let me know if you have any questions. Keep Right’in Code!